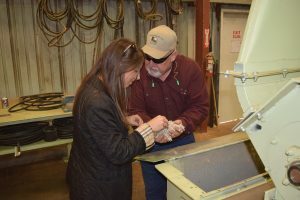 This week the California Cotton Ginners and Growers Associations hosted Kristina Dunklin, Legislative Director for Congressman David Valadao (21st Congressional District), Jilian Plank, Legislative Director for Congressman Devin Nunes ((22nd Congressional District) and Ruth Hazdovac, Staff Assistant for Congressman Nunes. The group toured several agricultural sites with CCGGA President/CEO Roger A. Isom, CCGGA Director of Technical Services Christopher McGlothlin and Western Agricultural Processors Association (WAPA) Safety Specialist Priscilla Rodriguez. Of particular interest, the group visited County Line Gin. The purpose of the visit was to discuss implementation issues with the Food Safety Modernization Act (FSMA), in particular, the current applicability of the Preventive Controls Rule for Animal Food to a cotton gin. CCGGA is working with the National Cotton Ginners Association and the National Cotton Council along with members of Congress and the Senate to have FDA address this discrepancy. Pictured here, Kristina Dunklin discussing the FSMA Rule with Wayne Gilbert. This entry was posted in NEWS & ISSUES on November 2, 2016 by ccgga.